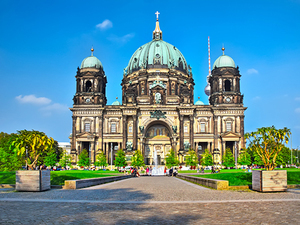 Berlin, a major center of politics, media, science, and culture, is the capital of Germany. It is also a shipping port in Northeastern Germany on the Northern European Plain. Fascinatingly, it was formed in an Ice Age glacial valley. July temperatures average around 100F or 38C in July. But winters are definitely chilly at 31F or -.5C, just below freezing. If you are traveling on a cruise ship, the major port is Warnemunde located approximately 2 hours away. Many of the cruise lines have shuttles available. Round-trip route with on/off privileges in Berlin! Climate-controlled buses with Wi-Fi and Wheelchair access! Easy to use system map of Berlin! Audio narration on the bus - available in 9 languages! 2 different routes to explore! A total of 25 Bus stops at the must-see sites! 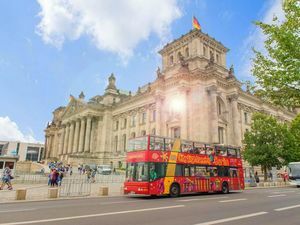 For the best way to explore Berlin is this Warnemunde Excursion, a comfortable double-decker bus that allows you to hop on and hop off at different stops all day is perfect. Whether this is your first visit, or you've been to Berlin before, you can't go wrong with this choice. Round-trip transportation from your Warnemunde/Rostock Cruise pier! English speaking professional guide at Berlin! Headsets provided for groups of 20 guests or more! Exterior visits to Reichstag, Brandenburg Gate, Memorial to the Murdered Sinti, Checkpoint Charlie, Gendarmenmarkt, and Bebelplatz plus many more! Enjoy your day in Berlin and see the top highlights. You'll have the chance to explore some of the most iconic places of this historic European city. 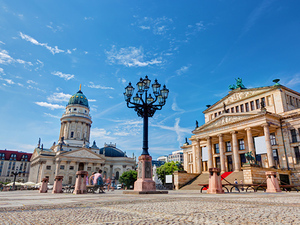 See the Reichstag, Checkpoint Charlie, Bebeplatz and many more! Round-trip transportation from your Warnemunde Cruise pier! Visit the Sachsenhausen Concentration Camp Memorial! Entrance fee to Sachsenhausen Concentration Camp Memorial! Take in the highlights of Berlin followed by a somber visit to the Sachsenhausen Concentration Camp Memorial. Learn about the history, events, and details of Germany's present and past. Guided walking exploration of Warnemunde and Rostock! Roundtrip Public Transport tickets from Warnemunde to Rostock! See Rostock Town Hall, University, Town Wall and Gates and many more! Visit St. Marien Church and astronomical clock! Entrance fee to St. Marien Church! Warnemunde is more than just one of the busiest ports in Europe. It is history, it is culture, it is a lively seaside village beckoning the visitor to come and explore. 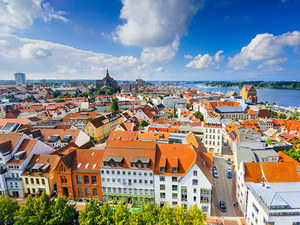 Rostock provides an opportunity to experience old world charm with its impressive monuments, gorgeous gabled houses, great churches with 330 feet high towers, enormous cellars, impressive gates, and massive dams. Explore both!